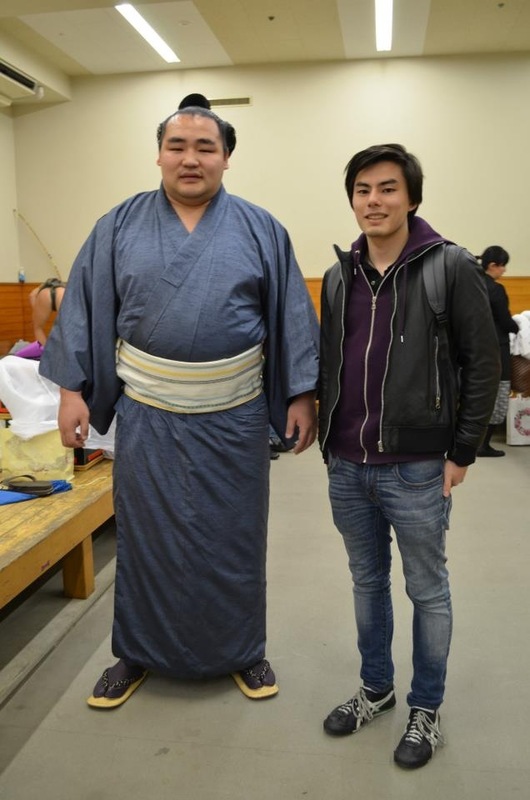 A sumo wrestler with Hironobu Itabashi, an assistant and translator with the Dateline Tokyo journalism program. I live with sumo wrestlers. They are out and about in the neighborhood where I am staying, Ryōgoku, the section of Tokyo that is the center of the sumo world. 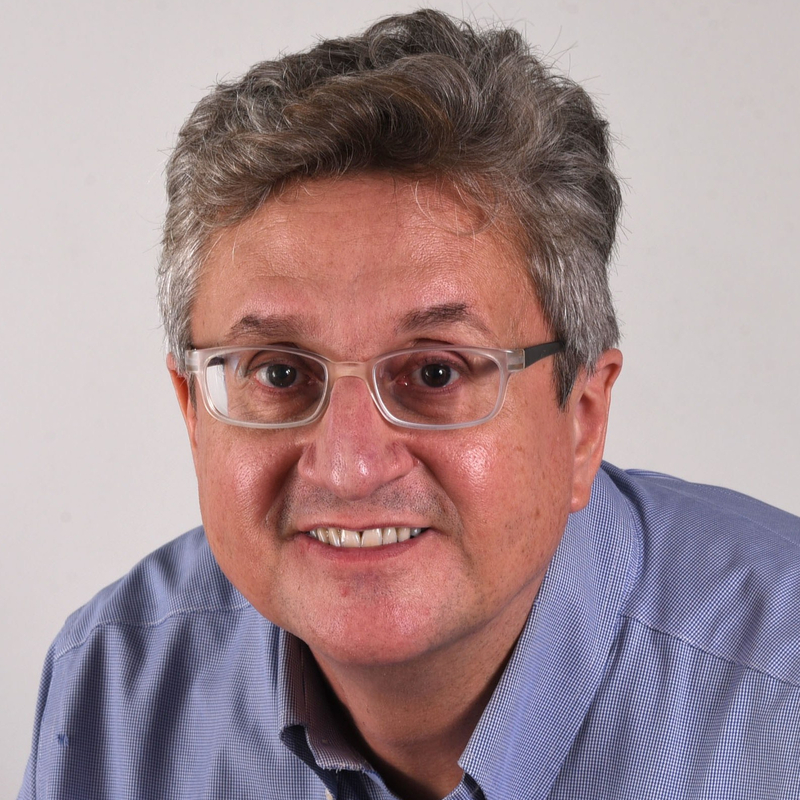 There is a sumo stadium, sumo stables where the big guys live and train, and chanko restaurants, where the big guys eat in vast quantities as part of a weight-gain diet. 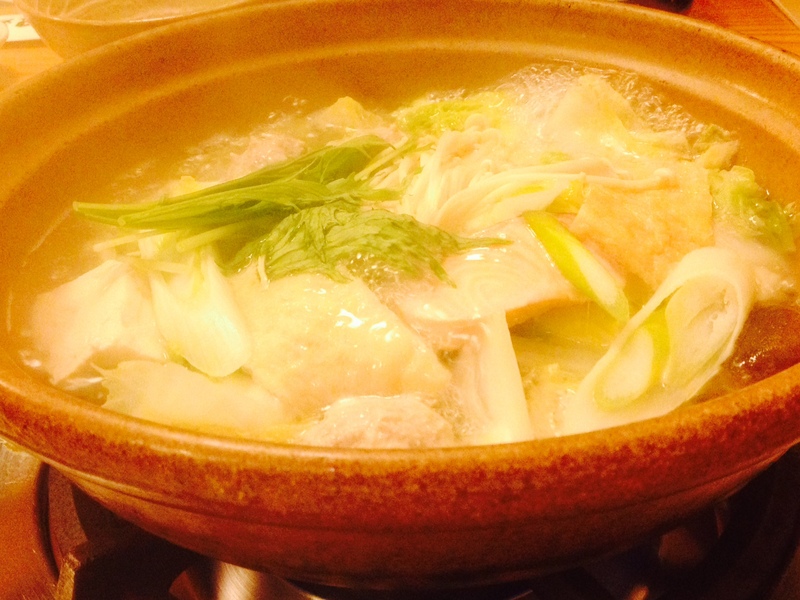 What they eat – every day – is chanko-nabe. Nabe means “pot” (or the big hearty soup that is made in that pot). Chanko means, more or less, the enormous meal that is prepared in multiple stages in that same pot. Luckily, a friend who is Japanese joined me for a chanko-nabe night out, and helped me to understand what was happening. We sat on the floor at a low table, a large ceramic nabe bowl at the center, and a gas burner underneath the bowl to cook and simmer the various ingredients. A smiling woman in a kimono knelt down to our level on the floor to talk about what we might like to have. The choices are many. First, you choose the soup base. First choice is a chanko-nabe with a soy taste, with a base of chicken broth and soy sauce. Second choice is described to me as salt taste, with a base of chicken and salt. Third is with a dashi stock made by soaking seaweed in water. Fourth is a soup with a base made of four different types of miso. And then there are choices involving the ingredients – beef, fish, shellfish, chicken, tofu and array of vegetables. We chose the dashi taste. And a mix of ingredients (as opposed to just one choice of beef, fish, veggies, etc). The waitress turned on the heat beneath our nabe bowl, and then returned with a massive tray of ingredients that would be cooked in the steaming bowl before us. Among the ingredients: two kinds of sliced fish, kajiki (marlin) and salmon; beef slices; two kinds of mushroom, shitake and enoki; clams; tofu; seafood balls; leeks; and mizuna (greens). 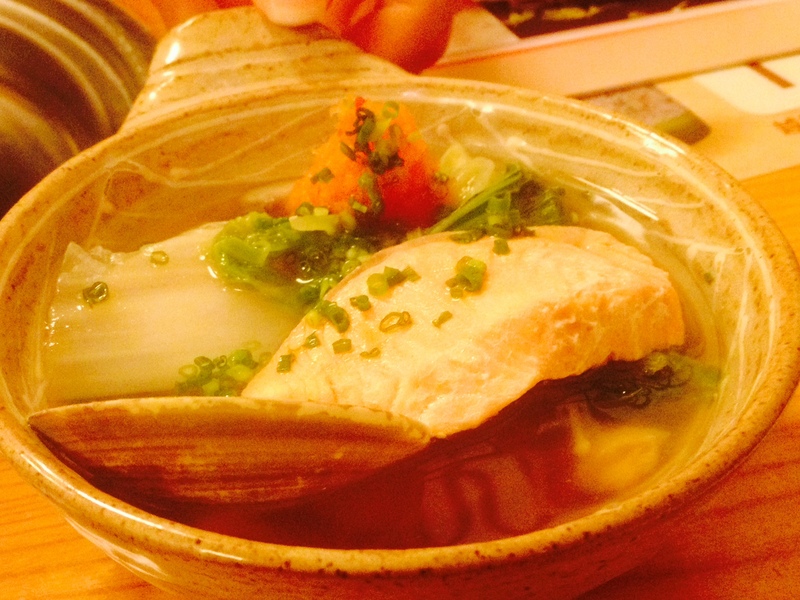 As the nabe bowl boils, it gives off heat that warms the body like a bonfire on a cool night. Sumo music plays, somewhat resembling the chanting of monks. Once the soup is boiling hot and then ladeled into your bowl, a liquid mix of soy sauce and yuzu (citrus) called ponzu is poured on and mixed in. And then the soup is sprinkled with diced leeks and a mix of carrot and red pepper. The result is astounding. The beef was succulent, the fish perfectly cooked and flavorful, the vegetables crisp and fresh, and the broth rich and thick and savory, with a great citrusy aftertaste. Beer seems to be the beverage of choice to go with chanko-nabe. Another good way to pack on the calories. 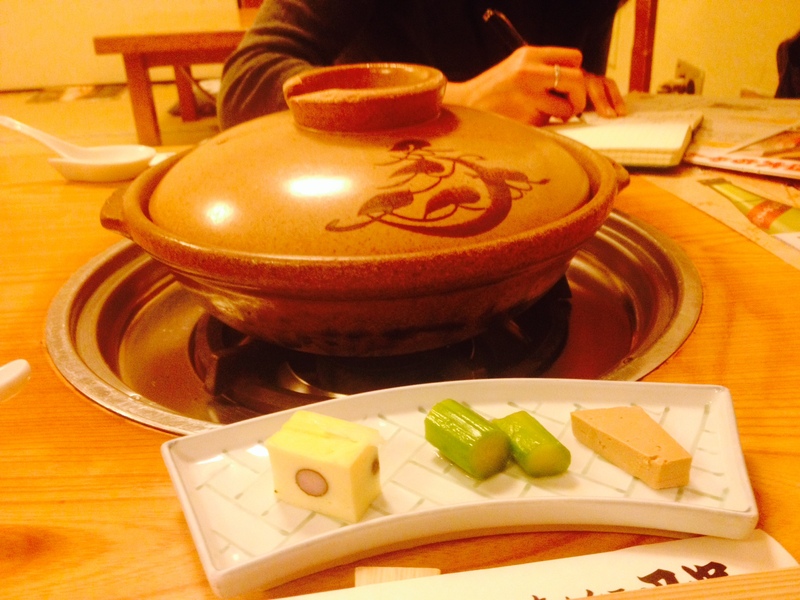 Before the main event, there was a pre-nabe appetizer course of a cheese and miso cube, mukagoshinjo, and asparagus. Along with the main meal, we ordered two side dishes. The first, wakadori-no-karange, is a moist and rich dark chicken meat deep fried in batter. Highly recommended. The second was tsukune, or grilled chicken meat balls. To my dining friend, these two dishes are the barometer of a good Japanese restaurant. Once we were completely sated, it was time for round two. Now is when the server returns with still more ingredients – rice, udon noodles, or rice cakes – to throw into the nabe bowl to really pack on the calories. This is what separates the sumo wrestler from the rest of us. We couldn’t eat another thing. Arigato, thank you. Chanko-nabe is somewhat similar to the big steamboat pot meals you get in other Asian cities, occasions for big joyous get-togethers with family and friends. But this one is unique to Japan for its approach and certain ingredients, and unique for its size — sumo. Thanks to Ayaka Hatta for translation and explanation. 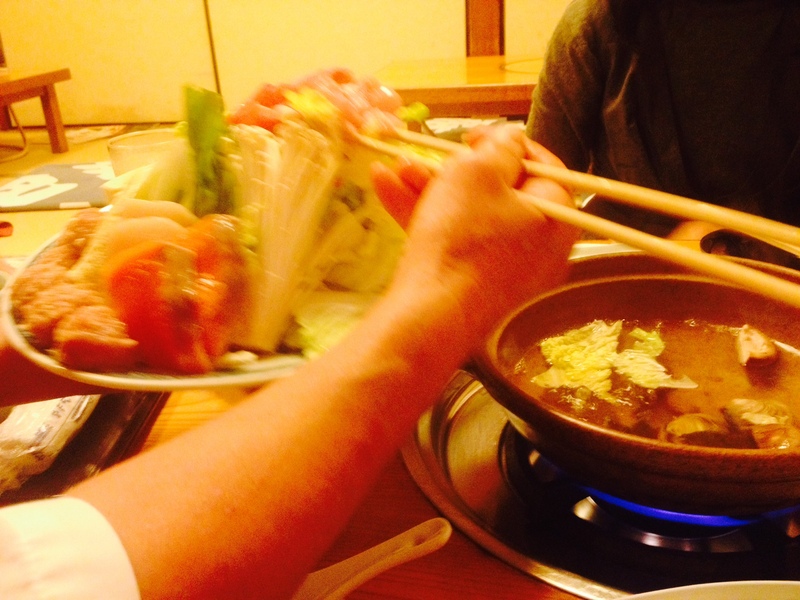 This entry was posted in Tokyo and tagged chanko-nabe, Cuisine, Japan, Ryogoku, Sumo, Tokyo. Bookmark the permalink.